The Jewish Museum in New York is currently exhibiting images by the 'Photo League', a group of photographers whose socio-political work was blacklisted in Cold War America. Janine DeFeo, Ceasefire's art critic, explores the exhibition. 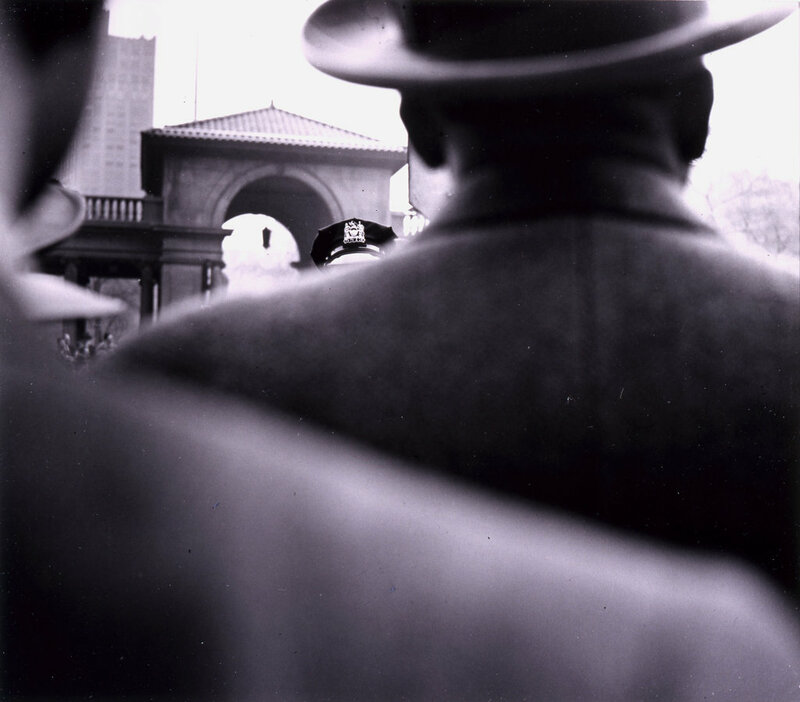 The greatness of Jerome Liebling’s photograph May Day, New York (1948) is how his camera restricts your vision: your view is blocked by figures in a crowd, standing directly in your line of sight (Liebling’s guileless photographic technique is responsible for this effect – you know he stood where you stand now). Over a man’s shoulders you see a policeman (or rather you see a symbolic attribute and understand a policeman). The photograph is simultaneously an image of solidarity and resistance and of authority and control. It is quietly, subtly suggestive of a moment in American political history when the paranoia of Cold War McCarthyism made demonstrations of working-class solidarity like this one significant, dangerous gestures. The image communicates this experience through a restrained balance of immediacy and abstraction; it is aesthetically compelling and still rigorously engaged with its contemporary social and political reality. As such, it is emblematic of the work of the Photo League, a group of photographers based in New York between 1936 and 1951, the subject of The Jewish Museum’s current temporary exhibition, ‘The Radical Camera’. The exhibition seeks to contextualise the Photo League, focusing on the Great Depression, the Second World War and the Cold War, which ultimately destroyed it – the Photo League was blacklisted in 1947 and finally dissolved in 1951. This attempt to place the League in history is connected to an attempt to argue for the Photo League’s central art historical importance in the development of documentary photography. The exhibition is arranged vaguely chronologically, which keeps the show logically organized despite its two-part mission. 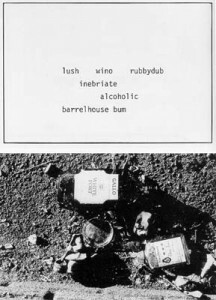 The photographs are legible to a wide audience (as indeed they were originally intended to be), but the art historical arguments could have been more clearly presented. Despite the show’s claim that the work of the Photo League ‘propelled documentary photography from factual images to more challenging ones – from bearing witness to questioning one’s own bearings in the world,’ the vast majority of the photographs in the show are treated as straightforward and objective. 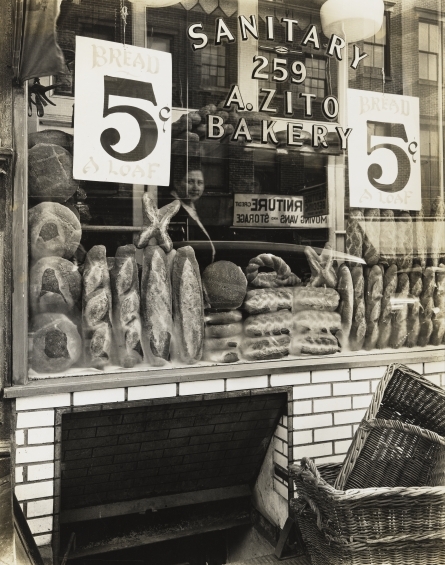 The viewer is encouraged to see the photographs as their subjects: the wall text next to Berenice Abbott’s Zito’s Bakery, 259 Bleecker Street, for example, mentions the influence of French photographer Eugène Atget without further explanation, going on to note that the bakery in the photograph closed in 2004. The exhibition attempts to argue that Photo League members initially rejected the formal concerns of modernism and became more interested in aesthetics as time went on, and the show reflects this, with the wall texts increasingly dwelling on artistry as you go further through. But there is evidence of a formalistic impulse from the very beginning, in pictures like Alexander Allland’s 1938 photograph of the Brooklyn Bridge, deliberately composed to highlight the utilitarian beauty of modern engineering. The picture is ‘straightforward’ in terms of Alland’s perspective but the image is not an accidental snapshot or a simple representation of the real Brooklyn Bridge. A more careful exploration of the relationship between the subject and the act of representation in the exhibition’s photographs would have been rewarding because that negotiation is perhaps the essence of photography in general, and it is a crucial part of the work of the Photo League artists in particular, because they explicitly made ‘real life’ their subject. The Photo League’s documentary photography was, however, not neutral; it was meant to have a sociopolitical function. Thus the photographers had to represent ‘reality’ as affectingly as possible, and this opens their work up to criticisms of tokenism and misrepresentation. ‘The Radical Camera’ addresses this in a subsection devoted to ‘Harlem Document’, a project led by Aaron Siskind between 1936 and 1940, producing photographs like his untitled photograph of a man in his bedroom in ‘The Most Crowded Block in the World’ (not included in this exhibition). Look magazine used the images from ‘Harlem Document’ to illustrate a story about the environment that produced Bigger Thomas, the murderer at the center of Richard Wright’s Native Son. But the members of the Photo League did not only look to frame and capture images of real life as outsiders; they sought to capture images of neighbourhoods they really inhabited. As such, a considerable part of the work of the Photo League defies the tendency to produce fetish-images of poverty, instead producing dynamic images of a varied, lively urban reality. The everyday was not always portrayed as oppressive: Morris Engel and Ruth Orkin’s 1953 film Little Fugitive, shown at the end of the exhibition, re-imagines reality as a child’s adventure, represented with a good-natured appreciation for detail. And many of the photographers gave their subjects some chance to assert themselves in representations of resistance like Alexander Alland’s Break the Grip of Exploitation (1938) and Liebling’s image of May Day, above. ‘The Radical Camera’ promises to be a popular exhibition in New York because street photography is popular, apparently pausing and holding a delicate ‘real’ moment of a rapidly moving local history. But what ‘The Radical Camera’ really demonstrates is how the work of the Photo League captured a ‘reality’ by staging it, politically and aesthetically.